Boone County Health Center’s (BCHC’s) new MRI unit is up and scanning. In accordance with the American College of Radiology, MRI Safety Zone signs have been hung in the hallways and entrances at BCHC. “Patient safety is our first priority. With stronger magnets come stronger restrictions to make sure all patients are safe. This includes both those who are MRI patients and those who are not,” said Melissa Wiese, RT. The American College of Radiology has defined four safety zones that correspond to the level of increasing magnetic field exposure. These zones are labeled Zone I through IV. Zone I is described as freely accessible to the general public without supervision. 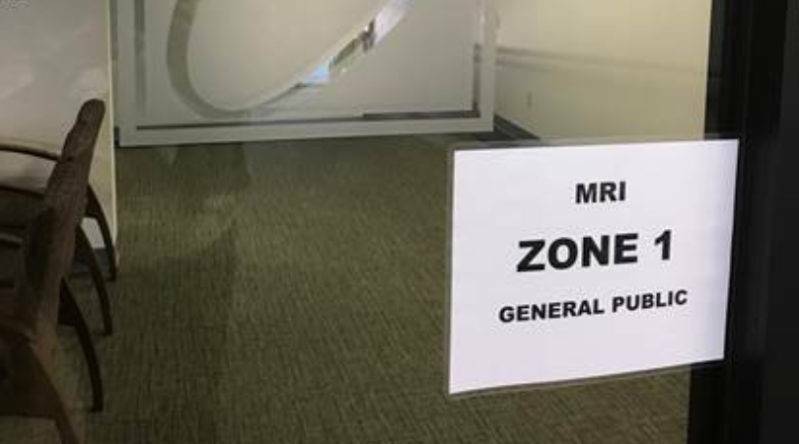 Zone II is still a public area, but MRI patients can check in here at the reception desks and are typically screened with the questionnaire by Radiology. Radiology dressing rooms are also still only in Zone II. Zone III is an area near the MRI room where patients have been screened and are considered safe to have an MRI exam. In this zone, patients will be accompanied by an MRI technologist. This is typically the MRI computer room. Zone IV is the area inside the MRI scan room where the exposure to the magnet field is strong. There cannot be anything brought into the room that isn’t considered MRI safe. Boone County Health Center’s new MRI has added a wide variety of services for local patients.